The Benue State Caucus in the House of Representatives has cried out over withdrawal of soldiers, which they said has led to fresh attacks on communities where several persons were killed. The lawmakers said during a press conference in Abuja yesterday that it was “suspicious” for government to withdraw personnel of the Operation Cat Race and deploy them to other states, when normalcy had not returned to the state. 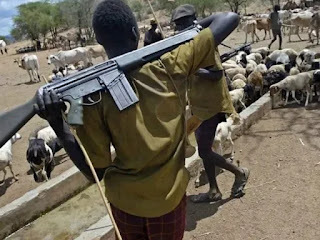 Reading a prepared text, John Dyegh (APC, Benue) in company of three of his colleagues, said there was no evidence that security operatives had disarmed suspected killer herdsmen in the state. He said, “We have cause once again to raise an alarm to the entire nation and the international community about the state of perpetual mourning that has been fostered upon the hapless citizens of our state by the endless and unhindered killing of our innocent and defenseless people by armed herdsmen. “As it was with the New Year attacks, the herdsmen have been on rampage in several communities in Guma, Gwer- west and Logo LGA’S since the day after Easter killing and maiming women and children and destroying homes and farmland without any intervention by security operatives even though the federal governments exercise Cat Race or ‘Ayem A Kpatema’ is supposed to be in place. “We are very seriously concerned and alarmed at the withdrawal of Personnel of exercise Cat Race from Benue when the herdsmen menace has not been curbed and the reasons for their continued deployment to other states in the region which has left Benue even more vulnerable and has paved the way for the recent despicable and premeditated attacks by the herdsmen in our communities. They challenged the Federal Government to immediately explain to Benue indigenes and the Nigerian people why the Cat Race exercise was terminated in the State without a resolution of the issue. “We urge the federal government to immediately declare these deadly herdsmen as terrorists in view of their inhuman, volatile and destructive activities and the international community to pay more attention to this ongoing pogrom of Benue people and appeal for their intervention in the provision of aid to the over 190,000 IDP’S at different camps in Benue State. “We believe it is only when these criminal and vicious elements are properly designated and treated as terrorists that the spate of killings would be put to rest,” he stated.